United States President Donald J. Trump makes remarks as he hosts a naturalization ceremony in the Oval Office of the White House in Washington, DC on Saturday, January 19, 2019. Following a week marked by his pointed clashes with House Speaker Nancy Pelosi, it was not clear if Trump's offer would lead to serious steps to reopen the government, shut for a record 30 days. Trump's move came as hundreds of thousands of federal workers go without paychecks, with many enduring financial hardship. Many public services are unavailable to Americans during the closure. 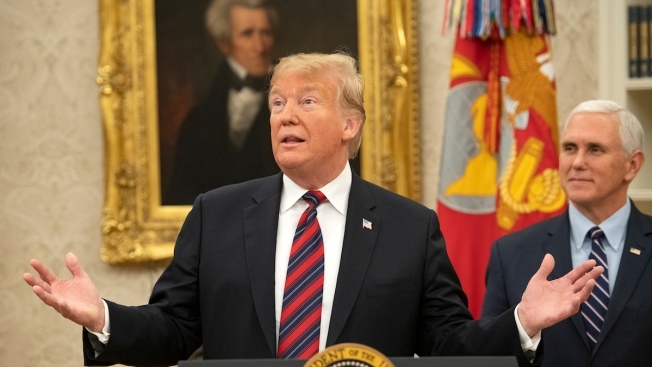 Sunday morning Trump responded with a series of tweets attacking Pelosi and defending his plan against charges from conservatives that it amounted to offering amnesty to undocumented immigrants.